A little bit of preparation goes a long way when it comes to choosing wisely, so here’s a helpful cheat sheet to ensure you buy smart, stylish AND safe. Ensure that your high chair complies with current Australian safety standards (AS 4684-2009 High chairs—Safety requirements). Not only does this keep your baby safe, it gives you peace of mind. It’s vital that your chosen high chair is easy to clean. We can’t stress how important this is. You don’t want any nooks and crannies that baby-flung mashed pumpkin can tuck itself sneakily into. Streamlined and simple is best. Beat the pumpkin at its own game. Nobody wants some ugly monstrosity looming in the corner of the kitchen. Stylish good looks are definitely something to consider. You’re going to have to live with this useful chair for a couple of years, so make sure you like the look of it! Check out this ICandy MiChair, for instance. Not only does it tick all the boxes but amazingly it has an optional newborn bouncer attachment and converts to small chair when your child grows. Swoon! Choose a high chair that is easily accessible and simple to buckle up. 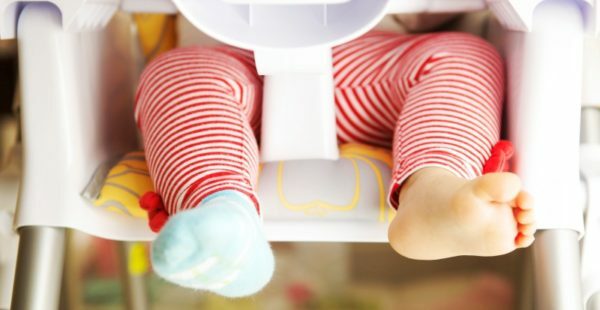 It can be tricky to get a tired and hungry baby seated and ready to eat, so make sure your high chair doesn’t make the job even harder. Speedy seating and lighting-fast harness adjustment are definitely something to keep in mind. You very often really do get what you pay for and while some retailers offer cut-price options, they may not tick a lot of boxes when it comes to safety and practicality. Spend wisely and you’ll end up with a long-lasting high chair that takes your baby from tiddler to toddler. Make sure that the chair is the right size for the room you’re in by checking it out on the showroom floor, if possible. Also consider how easy it is to fold away if you’re pushed for space. You don’t want it taking up the exact same amount of space folded up as it does in situ.